The MXGP circus rolls into Matterly Basin this weekend for the round 2 of the FIM World Motocross Championships, which also sees the start of EMX2T and EMX250 champs. With it being the first Euro GP and with British riders getting the moto horn a hefty bunch of UK based talent are taking part throughout the classes, so let’s take a look at them. In MXGP the main trio of Max Anstie, Tommy Searle and Shaun Simpson will all fancy their chances of a podium position on home turf. All three showed good speed at round 1 in Argentina, and we all know what Max can do around Matterely after his MX of Nations 1-1 in 2017. Aside from these 3, the nations favourite privateer Josh Spinks is getting his MXGP boots wet and his early season form has been decent. Give him a good start he could hover round the top 20. Talking of starts Jake Millward is another MXGP Wildcard, and after his Fatcats Maxxis British Champs holeshot, and front of the pack speed, he could shock a few. MX2 is a bit bare on the British Wildcard front, but fans will have plenty to cheer about with Ben Watson having a pretty darn good chance of a podium spot, and dare we say it, with World Champ Jorge Prado out injured, the win! Adam Sterry is a demon from the traps, and with the home crowd behind him and pace up his sleeve a top 5 is within his grasp. Conrad Mewse is due a standout GP and our sources tell us he is super pumped for this one. It’s difficult to make a prediction on Conrad but I have a feeling he is going to pull something special out of the bag this weekend. Us Brits love a 2 Stroke and the newly named EMX2T class reflects that, with plenty of our boys taking to the grid for the championships opening round. When it comes to the win it’s hard to look further than double champ Brad Anderson aboard his Verde Substance KTM. Ando is a true fan favourite and there’s nothing he loves more than sticking it on the box in front of his home fans. Another rider who we will be looking forward to seeing on his 2 smoker is Todd Kellett, and regardless of result, he will be entertaining to watch. Brad Todd is a darkhorse. He has started the season well, and he is more than capable of a podium. Corey Hockey will carry the hopes of the West Country contingent in what is going to be a superb class to watch. Other UK racer’s James Rutter, Ben Putnam, Henry Siqqiqui, Bradley Wheeler, Jamie Law, Oliver Benton, Troy Willerton, Charlie Putnam, Matt Burrows, Jayden Murphy, Rob Hollyoake and Kelton Gywther all of which are capable of a big result on their day. There are so many riders entered in the EMX250 class that the qualifying system has reverted back to how it was in the days of Dirt Hub’s Jeff Perrett, where we have been told its a case of the fastest 40 go straight through to the 2 main races, rather than two heats and a LCQ. Among the 90 odd entries, Josh Gilbert is the one most people are looking forward to seeing. The Buildbase Honda rider set the domestic scene alight last year and likeable young racer will certainly have the fans behind him to do the same at Matterley this weekend. Local lad James Carpenter will also have plenty of fan backing too and there is no lack of pace from this young racer. Alexander Brown had a couple of good EMX rounds last year so will know the drill, and Adam Collings was looking superfast at Rocketworld midweek, although Jeff tells us he had a massive crash, totalling his bike and was lucky to get away from it without broken bones. 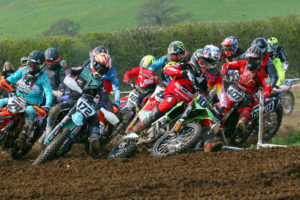 Michael Ellis has a good chance of qualifying too, and Taylor Hammal from our Feature Pro Motocross team Rob Hooper Racing has been looking quick in 2019. Chuck in the likes of Lewis Hall, Tom Neal, Callum Green, Tom Grimshaw, Jay Hague, Dominic Lancett, Ashton Dickinson, Ike Carter, Finley Beard, Ben Clark, Jack Bintcliffe, Calum Mitchell… there are loads of reasons to get to Matterley with your Union Jacks and cheer on the boys. British MXGP, EMX & VMX Rider Line up’s & Brit rider run down – Elliott Banks-Browne is out!